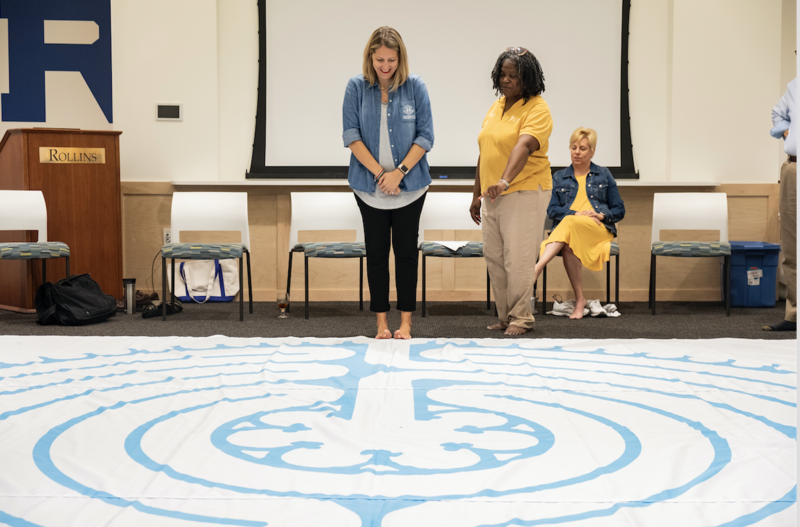 Rollins was awarded a $305,848 Garrett Lee Smith Campus Suicide Prevention grant from the Substance Abuse and Mental Health Services Administration, a government agency within United States Department of Health and Human Services. The grant’s timing comes after two Rollins students have died by suicide in the past six months. Rollins is one of 20 schools across the U.S. to receive the grant and the funds will be dispersed across a three year period to support infrastructure and activities that help prevent, intervene and understand students suffering from depression, mental health and substance abuse disorders. This is a matching grant; therefore, federal funds will provide 47 percent of the financing and Rollins will provide 53 percent. Although money can’t buy happiness, it can buy research and suicide prevention is just as much a scientific study as it is a philosophical one. In fact, several studies have been conducted by the Substance Abuse and Mental Health Administration that contribute to how college wellness centers pick their approach. The grant money will be useful in laying a foundation for further research and training even after the three years is up. The leaders and staff that are already trained with the money from the grant will be able to pass on the training and inform the whole community. “I think for us, you want to build what’s considered an ‘infrastructure.’ We want to increase our ability to respond effectively even when the money’s not there,” said Connie Briscoe, director of the Wellness Center. To judge what is and is not effective, the Wellness Center must conduct their own research at Rollins and report it back to the administration. If it is considered a good approach, it will be listed as a “best practice” in a database that holds different suicide initiatives with rating systems. The data is collected across the country from different institutions that have received the grant and participated in the program, and now Rollins will provide their findings, too. “We want to be very intentional about doing the types of things that we know [has] research that supports it,” said Briscoe. There is also a conversation about how students from different cultures and backgrounds respond to different approaches, as the effectiveness may depend on the group that they’re focusing on. Discussions about doing culturally sensitive work have only come to the forefront in the past 10 years or so, Briscoe said. “We’re adjusting what we’re doing to fit the populations… that really helps improve the mental health of people of various cultural backgrounds,” she said. The Wellness Center will also be partnering with the STEVE foundation, an organization focused on supporting the mental health and emotional well-being of young people of color. “Our hope is to have them actually come to our campus and talk to our different student groups, to do a sort of an environmental scan,” Briscoe said. A tactic that has been known to show results is Gatekeeper training, commonly known as Question, Persuade, and Refer (QPR), which is a figurative checkpoint used to catch suicidal tendencies early on. Currently, peer mentors and resident assistants go through basic QPR training before the fall semester begins, as they interact closely with students. “They’re the ones who are going to see students, who students may go to first,” Briscoe said. “Our goal is to eventually, over the course of three years, have at least a quarter of our campus community, who knows the warning signs of suicide and who knows how to intervene when someone is struggling,” she said. Building the campus’ defense against suicide will be an ongoing project as it has been for many years, but the community is ready to guard itself with as much knowledge as possible. Suicide is the second leading cause of death globally for 15 to 29-year-olds, according to the Center for Disease Control and Prevention. Suicide rates rose steadily in every state from 1999 to 2016, their research showed, and in 2016, there were more than twice as many suicides as homicides. In the past year, celebrities such as Anthony Bourdain, Kate Spade and Avicii have died. Rollins has also experienced student deaths from suicide, as sophomore JV baseball player Brennen Bennett died in March and Samuel Morse died in July. While the Wellness Center applied for the funding before the suicides took place, Briscoe said the grant is coming at a necessary time. For Rollins services, students should call 833-848-1761 to speak to a counselor, or contact the Dean of Students/Student and Family Care at 407-646-2345 or care@rollins.edu for additional support services. Faculty and staff may access services of the Employee Assistance Program by calling 877-398-5816.